DECK TECH: YUUSEI GOTOU'S "NO AFFINITY"
It would be fair to call this weekend Yuusei Gotou's debut. Known locally as a prodigious deckbuilder, Gotou supplied Naoki Nakada with the deck that took him to the Top 8 of Pro Tour Paris. There's no glory in being the power behind the throne, however. Here at GP Kobe Gotou stepped into the spotlight by putting up a perfect 9-0 Day 1. Now, sitting at 11-1, he's within striking distance of his first Top 8. I asked him if he was nervous. He laughed and admitted that this morning he'd been feeling the butterflies, but now that he was into the swing of the tournament he was fine. Naturally, he's playing a personal concoction. Laid out, it looks like some kind of haute cuisine reimagining of Affinity, and indeed the stock Affinity list was where it started. Gotou had seen the raw power of Affinity, the speed with which it overwhelms opponents in game one. The problem came in the sideboarded games. As the format's premier beatdown deck, Affinity has a big target on its back. Players come prepared, and it's hard to survive fifteen rounds of hate. So Gotou started looking for non-artifact threats that could shore things up. First up was obviously Tarmogoyf, but you don't get a reputation as a deck designer to watch by adding four Tarmogoyfs to your list and calling it a masterpiece. The more he tinkered, the more Gotou found himself dissatisfied with the heart of the deck. So, he gutted the works. No Signal Pests, no Steel Overseers, no Arcbound Ravagers, no Etched Oracles. Only the raw power of Cranial Plating saved it from the chopping block. "You still need that speed, so you want to have access to powerful opening plays. It means having to play all the Ornithopters and Memnites, but you can do a lot of damage very quickly." That's where the other part of the deck kicks in. Gotou runs a full complement of Galvanic Blasts and Shrapnel Blasts, burn spells that really mean business. He also plays four Ensoul Artifact, which catches opponents off-guard as a hasty 5/5 attacker. "Really I don't consider it a creature. It's not going to hit more than once, but I only need that once. It's like Ball Lightning." So many decks in this format play painful manabases, it's hard for them to stay out of his burn range. "I've won games without attacking. Last round my opponent took three from fetching out a shockland, and then another four to Dismember my Tarmogoyf. At that point my hand was two Shrapnel Blasts and a Galvanic Blast." The decreased reliance on artifact creatures has another benefit beyond sidestepping the popular sideboard cards. It also means that Gotou has more leeway when bringing in his own sideboard cards. His creatures don't have the same interdependence those of traditional Affinity do, which gives him the option of bringing in many cards without worrying that his deck will lack that critical mass. The deck does have a very low land count, but that hasn't proven to be a problem. 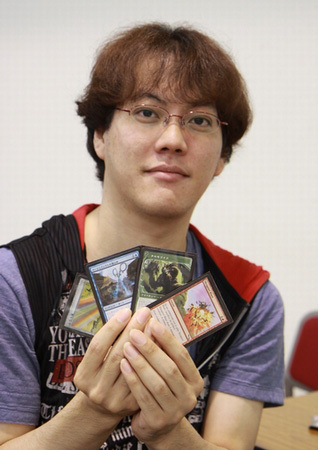 Gotou admits that his mulligan rate is quite high, but his six card hands aren't that much worse than a full hand. The deck's spells are so cheap that it only needs two mana to function. And of course, the low land count cuts the other way, making it harder for him to flood out. If you're looking for something unorthodox, you should definitely take this for a spin.